OVERPRINTED REVENUE. SIERRA LEONE Queen Victoria. MINT Lightly Hinged - Full Original Gum. 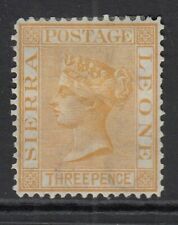 SIERRA LEONE Queen Victoria 1896. MINT Very Lightly Hinged - Original Gum. Add to Favourites. SIERRA LEONE Queen Victoria 1888. MINT Very Lightly Hinged - Full Original Gum. made with love by. Catalogue Value £27 . Sierra Leone 1859 dull-purple 6d mounted mint SG1 small gum disturbance bottom edge but good condition for this issue. SIERRA LEONE THE 1872-3 QV 1d ROSE RED CC WAT SIDEWAYS MOUNTED MINT ,SEE SCANS. Rest of World. Sierra Leone 1897 QV 2½d on 6d dull purple & green MLH. SG 60. Sc 53. Sierra Leone 1897 QV 2½d on 6d dull purple & green (SG Type 10 surch) mint lightly hinged. Gibbons # 60. Scott #53. 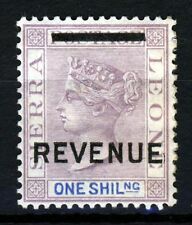 One Shilling Mauve & Blue Overprinted REVENUE. SIERRA LEONE Queen Victoria 1890. MINT Lightly Hinged - Full Original Gum. Sierra Leone 1886 2d SG 30 m/mint. SIERRA LEONE THE 1872-3 QV 1/- GREEN PERF 12.5 CC WAT SIDEWAYS MOUNTED MINT ,SEE SCANS. International signed for - £7.25. Rest of World. 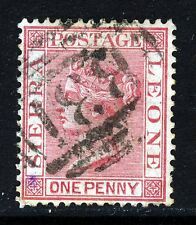 SIERRA LEONE 1/-. Mauve & Blue QV Overprinted REVENUE Mounted Mint Toning. With Scarce RED-BROWN B31 Cancel. SIERRA LEONE Queen Victoria 1884. made with love by. Very Fine Used.